In person authentication fees vary. Ask for price quote. Call for rates on multi-signed items, letters, documents, etc. 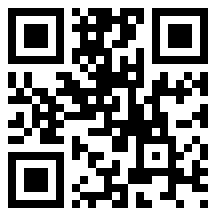 Include remittance with order or use our PayPal account on Products Page. If appropriate, we mark your item with invisible and visible ink. No ugly holograms to mar appearance of autograph. 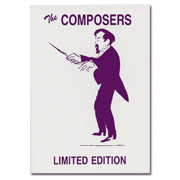 The Composers is a 72 card boxed set. Featured are 69 of the greatest composers that ever lived. The back of each card contains biographical information along with musical accomplishments and works. 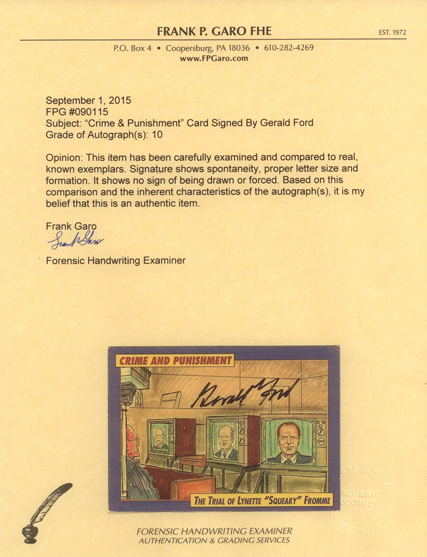 Sixty of the cards have the composer’s facsimile autograph. Among the composers featured are Mozart, Beethoven, Debussy, Wagner, Bach, Brahms, Chopin, Gershwin, Ives, Strauss, Schubert, Verdi, Stravinsky, Haydn, Handel, Tchaikovsky, etc. That’s correct! Less than 5,000 sets. A REAL limited edition! What does the Lone Ranger have to do with The Composers? More than you think. The long running Lone Ranger radio and television series used classical music quite extensively. It’s famous theme is Rossini’s William Tell Overture. Mendelssohn’s Hebrides Overture and Liszt’s Les Préludes were used as background and bridge music. Each set contains 3 special cards. The composers, whose music was used on the Lone Ranger, are portrayed as masked cowboys! Each also has a regular card. Complete set of 25 Wild West cards. 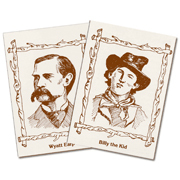 Butch Cassidy, The Sundance Kid, Wild Bill Hickok, Wyatt Earp, Jesse James, Billy the Kid, etc. Frank Garo Produced 4,000 sets. 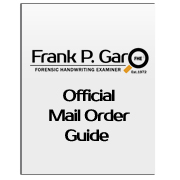 Successful entrepreneur Frank Garo shows you how to start and run your own internet/mail order business. 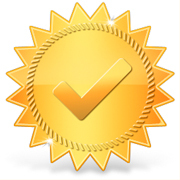 This 60 page easy to read book shows innovative and proven methods to make and save you money. You can do nothing or change your life forever for just $5.00. If you are not satisfied, return the book within 30 days for a no questions asked refund. 1 Copy – $5.00 ppd. This set was produced by Frank Garo in 1979. It has been sold out for years. Just recently, 60 uncut sheets were found. The sheets were cut into sets. Only 5,000 sets were made and we are making these 60 sets available at this special price. 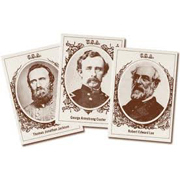 Complete sets of 50 Famous Civil War Generals. 25 Confederate, 25 Union. Included are Jackson, Lee, Grant, Sherman, Stuart, Sheridan, Pickett, Custer, Longstreet, etc. All images are from photos taken during the war. Complete Set of 50 Cards – $25.00 ppd.